I’ve seen The Selection compared to The Hunger Games and quite frankly that bothers me because all Dystopian novels are not like The Hunger Games; just like vampire books are not all like Twilight! That being said I can see where a small part of this book could be compared; there’s a TV show in the story with an enigmatic host who interviews the girls but, that is where the comparisons end in my opinion. I liked this book I wouldn’t say it’s a favorite but the story is really cute and I enjoyed the characters. I’ll admit I wasn’t a big fan of the MC’s name but I liked her characteristics so I could overlook it. I really loved both the male leads Aspen and Maxon they were both genuine good people and as hard as the situation was they tried to make the best of it. I did enjoy the Bachelor aspect to it I’m not a fan of the TV show but I think Kiera created a version that incorporated the TV show in a fairy tale way that made it work. I decided on a passage between Maxon and Mer (I prefer her nickname lol) that I found quite funny. “Not a chance,” I whispered. “I’ll keep trying. I don’t have it in me to give up.” And I believed him. It was annoying to think he’d press that issue. “Did you call all of them that?” I nodded my head toward the rest of the room. “That is the exact reason why I don’t.” And I stood. Maxon was chuckling as he rose with me. I would have scowled, but it actually was kind of funny. He bowed, I curtsied, and I went back to my seat. 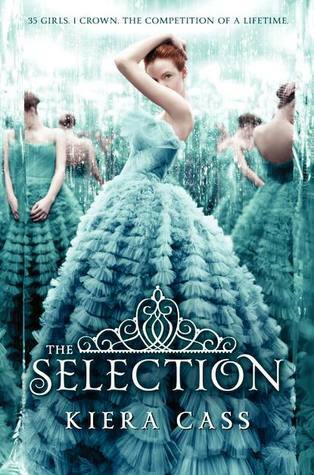 Add The Selection to your Goodreads shelves. Pre- order your copy here! Great quote! I'm not a big fan of the Bachelor tv show either but I think it will make a great story in this book. The only thing I dread is the love triangle. I will want her to be with her first love but this prince guy sounds sweet too. I'm looking forward to the book! Thanks for sharing your thoughts Jaime! And I always compared The Hunger Games (which I hadn't read) to The Running Man, which sounded exactly like it, but apparently is much different. So I know all about incorrect comparisons. I do agree about the name, but I bet it works for this book. I'm glad to finally see a positive review for this book. Despite some things I'm worried about with this book in particular, but I'm still looking forward to it. The cover is WOW. Great review. I've seen other positive reviews for it. I don't let the drama dictate what I read. I think that it's ridiculous that anyone would. Great review...but I think I'll hold off on reading this one anytime soon. I was iffy about this book because of the reality show aspect (I loathe them) and Hunger Games comparisons (haven't read the series and have zero desire to, though I do like other dystopian novels) so you're review was really helpful, thanks. And I agree about the name, her nickname is much better!